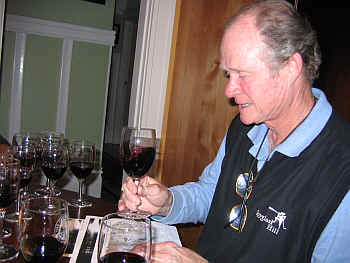 The 2004 Cabernets are starting to arrive and host Ernie Anderson assembled an interesting range of wines. We tasted 7 wines from the challenging 2004 vintage and one wine from 2002. The growing season in 2004 was rather mild until the start of September. Then the North Coast experienced high temperatures, warm winds and low humidity. Winemakers were challenged to determine the optimum picking time, trying to match actually 'ripeness' or maturity with sugar levels. 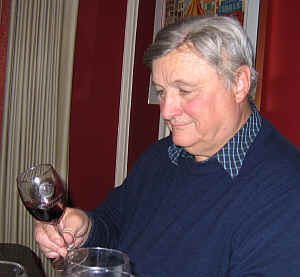 Ernie's range of wines included famous, benchmark wineries to unknown, little-heard-of producers. 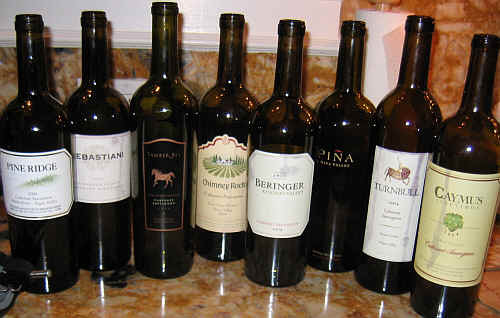 Also, we had a nice range of prices, from affordable to premium-priced Cabernets. 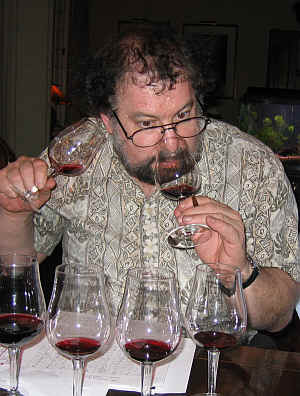 There were three wines which were closely bunched at the head of the class. Three wines were at the bottom of the heap, with a corked bottle garnering only two out of 12 last place votes. That means some tasters preferred the "corked" or musty character to un-tainted wines! Though this was a corked bottle, only 2 tasters "disqualified" it and dropped the wine to last place. 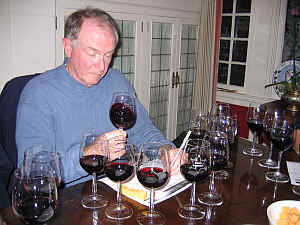 Ten tasters were able to overlook the musty elements of this wine, though only 2 people had it in their "upper division." One person had it ranked third! Having tasted this a couple of times, I can tell you this was a sad, "off" bottle. Every bottle is a new adventure, though. Showing medium ruby color, this wine offers light, simple red fruit aromas which seemed rather superficial to me. The wine is dry and mild in terms of acidity. Medium-bodied, I found hints of licorice on the palate, with light tannins. It seemed a bit hollow to me and was a perfectly pleasant, standard bottle of Cabernet. I didn't find it worthy of its lofty price tag of $58 and even though Ernie picked up this bottle of $38, it's still not worth that premium price. No stars on my three star scale, signifying an ordinary or standard quality bottle of wine. Displaying a deep ruby color, the Pia family's Cabernet offers high-toned, dark fruit aromas. I detected some floral tones on the nose and a hint of candied violets. 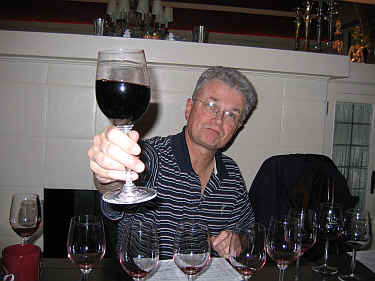 The wine is fairly full on the palate, with dark fruit flavors, hints of anise and deep, woodsy tones. Howell Mountain wines tend to be fairly tannic, but this seemed nicely balanced and worthy of five to eight years of cellaring. I gave it one-and-a-half stars on my three star scale. With medium ruby color, Beringer's main Cabernet struck me as having dusty fragrances and some red fruit aromas. It's dry but soft and verging on "flat" as far as its impact on the palate. This is simple, easy-drinking "plonk" and an entry-level red wine for people graduating from flabby or sweet Chardonnays to the "Promised Land" of Cabernet Sauvignon. This used to be a more interesting red wine...now it's as if they're making Cabernet-with-training-wheels for those learning to "ride" this vehicle. No stars from me, thank you! Here's a curious wine which shows immature, 'green' tones of unripe fruit, yet it's over-ripe, sweet and a bit jammy, so it has the worst of two worlds! Seemingly low in acidity, the wine DOES strike me as having a bit of residual sugar. The flavors are odd, displaying vegetal tones from under-ripe fruit, yet the wine is jammy and flabby. No thanks! No stars. Medium ruby red in color, this new Napa winery is named after a couple of horses raised by the owners of this enterprise. 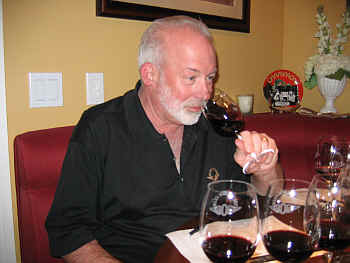 The wine seemed to offer mild red fruit fragrances and some cedary undertones. I also detected a note of smoke, reminding me of a wax candle that's just been extinguished. It's a bit coarse on the palate, having structure for cellaring...the question is does this have sufficient fruit to arrive at a point of balance? Maybe it does...but we won't know for about a decade. I gave it a one star rating and you can't kick about their relatively reasonable pricing policy. Wow! What's going on at Sebastiani?!?!? Though they've long been "competent" red-wine winemakers, lately they've been turning out unusually stylish wines at competitive prices. Deep ruby in color, here's a wine teeming with black and red fruit fragrances. There's a lovely cedary, woodsy note on the bouquet and hints of cocoa, too. Medium-full-bodied, Sebastiani's Alexander Valley Cabernet sports rich, creamy, vanillin flavors along with blackberry and currant fruit. Nicely balanced, this is drinkable now and should smooth further over the next five years. I gave it a one-and-a-half star rating, closing in on two stars. Remarkably good and affordably priced! I can't recall a Pine Ridge Cabernet faring as well in a tasting as did this one. 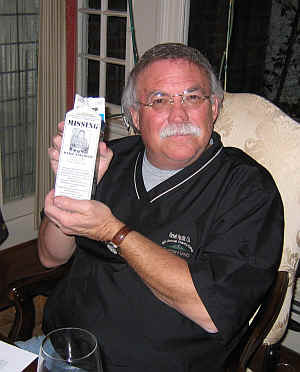 Their Rutherford bottling is deep and dark in color, with nice, cedary fragrances. I felt there was a dill-like character which emerged over the course of the tasting. Woodsy. I wondered if this was matured in 'green' or 'under-seasoned' oak? Medium-full in body and the flavors confirm the elements that I found on the nose. Nice fruit, woodsy, dark fruits, good oak, herbal, dill, more oak....nice. This can probably be cellared for five+ years. One-and-a-half stars.